I wake up very, very early every weekday morning to drive my son to school, and being a night owl by nature, I tend to stay up pretty late at night. As such, by every Thursday afternoon, I would be stoned. Don't even talk about Fridays. It is Thursday noon now, and seriously, this is what I need. Oh for a 20-min nap. 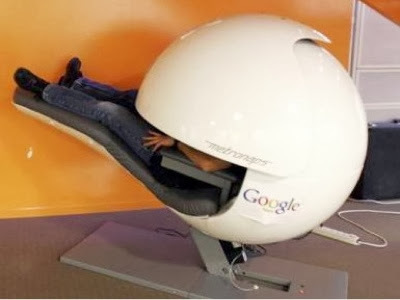 That Google helmet bed looks both scary and fun. Haha. It does, doesn't it?